About attorney Guy Paolino | Forbes Bender Paolino & DiSanti P.C. 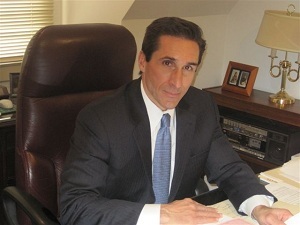 Guy has been an attorney for 30 years and was a founding member of Forbes, Bender & Paolino, P.C. in 1996. He represents injured individuals in personal injury matters including automobile, premises and work place accidents. Guy has handled numerous jury trials, as well as many arbitration and mediation matters; resulting in awards and settlements in six and seven figures. He represents corporations, and businesses and medical professionals concerning formation, transactions, sales and litigation matters. He also represents apartment complexes in all legal matters including purchases, sales, financing/refinancing and Landlord Tenant disputes as well as partnership and business issues. Throughout his career Guy has defended many insurance companies and their insured’s in automobile and premises claims. He serves as an arbitrator and mediator in civil disputes. Geographically, Guy’s practice is focused in the five county Philadelphia area. Guy is a 1980 graduate of the Villanova University with a degree in finance. He subsequently obtained his MBA in finance from Drexel University in 1981. Guy obtained his law degree in 1984 from the Widener University School of Law in Delaware. Guy is a member of the Delaware County Bar Association and the Pennsylvania Association of Justice. He is admitted to practice before the United States Supreme Court and all courts in the Commonwealth of Pennsylvania. Real Estate Sales, Purchases and Refinancing. Contact Guy at gpaolino@fbpdlaw.com or (610) 627-1700.